With the land use process out of the community board level, supporters and opponents of Haven Green, the affordable housing building that could replace the Elizabeth Street Garden in Nolita, faced off in front of the City Planning Commission (CPC) yesterday at a hearing on the proposed development. After representatives from the building’s developers and Housing and Preservation Development (HPD) went over the basics of 123-unit affordable housing development, over 30 speakers gave occasionally emotional testimony that veered into the class and race issues that intersect with the question of whether to keep the garden or build senior housing. Witnesses in favor of the garden cast the fight as one in which a beloved city landmark was being steamrolled by a government that wouldn’t listen. “My heart aches to have to stand here and defend something that’s been part of my life for 21 years,” Beth Joy Papaleo told planning commissioners, calling the garden “the fabric of our community.” Papaleo’s daughter, Vivie, spoke as well, opening her testimony with words from Dr. Suess’s The Lorax. 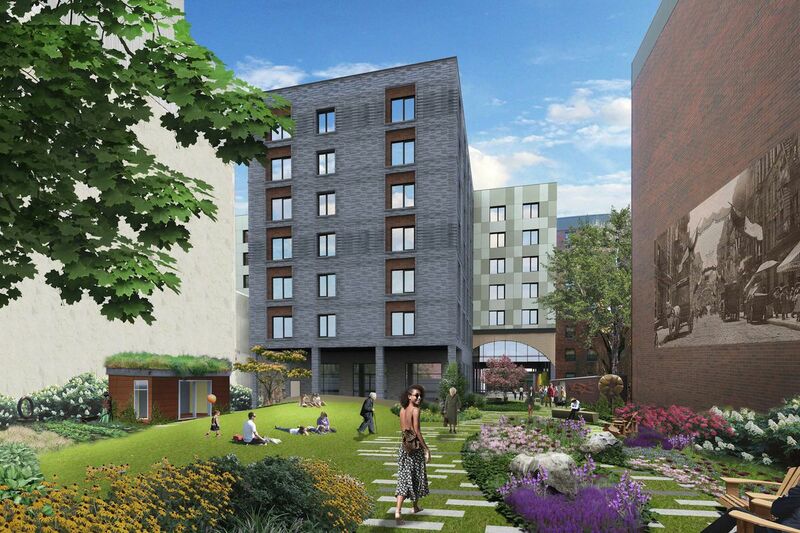 Joseph Reiver, the executive director of the Elizabeth Street Garden and the son of garden founder Allan Reiver, told the commission that the garden “is not just open space,” when making the case for its continued existence. “It’s not just a community garden, it’s not just park space, it’s not just a center for the community or just a museum—it’s all of these things combined,” he said. Housing supporters, on the other hand, pointed to the dearth of affordability in Community Board 2, where only 93 units of affordable housing have been built since 2014. “No one’s denying the people of Little Italy and Community Board 2 are underserved by open space,” Steve Herrick of the Cooper Square Committee said during his testimony, “but the lack of affordable housing is a much more severe crisis.” The lack of affordable units meant that “low-income people are locked out of Little Italy,” according to Herrick. “As a caring community, [CB2] can and must do better,” Valerio Orselli, also of the Cooper Square Committee, said during his testimony. Orselli also pointed to the nearby Sara D. Roosevelt Park as an example of nearby open space, and asked that the city’s Parks Department set aside 20,000 square feet there to add some of the amenities and statues that currently live in the Elizabeth Street Garden. The commissioners pressed those on both sides for answers relating to the housing project and the way the garden is run. Veanda Simmons, the director of Manhattan planning at HPD, was asked about the terms of the affordability; she later admitted that while the current agreement calls for rent-stabilizing the units for up to 60 years, the department could still only say there were “ongoing negotiations” around any further extension. In response to a question as to whether, as Manhattan Borough President Gale Brewer asked, the amount of green space included with Haven Green could be expanded by 30 percent, architect Matt Melody said that the project would have to break existing height cap on the building to both fit an acceptable number of affordable units and add more green space. Reiver blamed the current fight over the garden for the lack of funding for more volunteers to keep the land open more often, and promised the garden (which would sometimes be closed for fundraisers under one of the proposed futures for the garden site as a community land trust) would be more accessible if Haven Green was voted down. Reiver seemed to contradict the history of the garden that its supporters have put forward. Instead of an effort to get more green space moving parallel to Chin’s decision to ask the city to develop the space, Reiver told the commission that “upon realizing the city’s plans to develop this space, that’s when the community really got engaged” and reacted by opening it up with a street entrance instead of just letting people in through the gallery, an accessibility issue he dismissed as “the past” that the garden wouldn’t return to.